Reprinted from Parade Magazine’s Community Table. Written By Sanura Weathers. I first learned of Kwanzaa after graduating from college, when a Nigerian-American friend invited me over to her family’s dinner to celebrate the occasion. Years later, I would celebrate Kwanzaa in my home and use it as an opportunity to explore cuisines from the African diaspora: Caribbean, South American and Southeast Asian while contemplating on one of the daily principles. This year, our Kwanzaa could be influenced by Senegal because of the beauty of Pierre Thiam’s cookbook, From Senegal: Modern Senegalese Recipes from the Source to the Bowl. In the following Q&A, Thiam shares his knowledge about global influences in Senegalese cuisine, traditional ingredients and offers a wine pairing with his Chicken Thighs served with Red Palm and Coconut Rice, a twist of thiebou guinaar, that he calls the original jambalaya. What inspired you to pursue cooking as career? I come from a culture where cooking is a gender based activity, and food is at the center of everything. My mom and my aunts were great cooks but as a boy, the kitchen was a forbidden territory to me. The only man I ever saw cooking in Senegal was my godfather. Because he was of Vietnamese origins, he wasn’t bothered by these cultural restrictions. It’s only when I came to America to continue my studies in Physics and Chemistry that I stumbled into a restaurant job. That was the best thing that ever happened to me. Almost 30 years later, I am still in the kitchen. What are the cultural influences and/or regional difference in Senegalese cuisine? Senegal is located at the most western coast of Africa. Because of its geographical location, it’s a natural hub. For centuries, Senegal was the port of entrance to Africa for French, Dutch, English and Portuguese mariners. They each brought some of their cuisines. Casamance, a region in the southern part of Senegal has a strong Portuguese influence. Portuguese creole is widely spoken and dishes with Portuguese sounding names, like Pastels (a spicy fish turnover) or caldou (a lemony fish stew) are current. The French presence is felt all around, but mostly in the northern region of Saint Louis, which used to be the first French colonial capital. Dakar, the capital city, has a vibrant Lebanese community, but also boasts a Cape Verdean and even a Vietnamese one (another heritage from the French colonial past). Of course regional influences are also very strong. Many neighborhood restaurants specialize in cuisines from neighboring countries like Cote D’Ivoire, Cameroon, Mali or Morocco. What are traditional Senegalese ingredients? Grains: millet, fonio, our own local rice or sorghum. Greens: moringa, sorrel, sweet potato or cassava greens. What is a particular ingredient available in Senegal that isn’t normally found in the United States that you miss? How do you use or serve it? I miss a fruit called madd. It’s a sweet and sour fruit that’s found in Senegal during the rainy season. I used to make a relish with it by simply mixing it with cayenne pepper and salt. I also make a delicious sorbet with its juice. What does modernization of Senegalese recipes mean to you? It means making it more readily available for today’s conscious consumer. Senegalese traditional diet is a perfect balance of grains, greens and protein. I modernize the recipes by deconstruction and by giving them a lighter approach, while still remaining true to the traditional flavors. 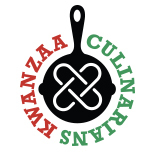 For Kwanzaa, what dish from “Senegal: Modern Senegalese Recipes from the Source to the Bowl” would you recommend? Chicken Thighs with Red Palm and Coconut Rice (recipe follows this interview). It’s a simple yet rich and festive looking dish (all the ingredients can be found at Whole Foods Market). Since this is a festive time of year, what type of wine would you pair with the recipe and why? House of Mandela’s Royal Reserve Shiraz, because it’s spiciness balances well with the richness of the dish. Thank you, Mr. Thiam, for taking the time to answer the interview questions and share the Chicken Thighs with Red Palm and Coconut Rice from your cookbook, From Senegal: Modern Senegalese Recipes from the Source to the Bowl. I wish you and your family a Happy Holiday and Kwanzaa! From Senegal: Modern Senegalese Recipes from the Source to the Bowl is available on Amazon, Barnes and Noble or Lake Isle Press. Season the chicken thighs with salt and pepper. In a large cast-iron pot or Dutch oven with a heavy lid, heat the vegetable oil over medium-high heat. When hot, working in batches if necessary, sear the chicken thighs very well, skin side first, letting the skin get a nice golden color (about 5 minutes) before turning once and browning the other side. Remove from the pot and set aside on a platter. Discard all but 1 tablespoon of rendered chicken fat. Add the onions and cook, stirring frequently with a wooden spoon, until soft and slightly golden, about 5 minutes. Add the garlic and the rice and stir to coat the rice well. Add the coconut milk and chicken stock and stir to combine. Bring to a boil, reduce the heat to a simmer, and stir in the red palm oil. Season with 1 teaspoon salt and 1 teaspoon pepper. Return the chicken thighs and any juices to the pot, setting them on top of the rice, and cover. Simmer for 25 to 30 minutes, until all the liquid is absorbed, the rice is tender, and the chicken is cooked through. When you’re ready to serve, squeeze the lime juice all over the chicken and rice and generously top with cilantro. Serve with a side of greens. Chicken Thighs with Red Palm and Coconut Rice reprinted with permission from From Senegal: Modern Senegalese Recipes from the Source to the Bowl by Pierre Thiam with Jennifer Sit, Lake Isle Press, September 2015. Disclaimer: I was provided a copy of the Senegal: Modern Senegalese Recipes from the Source to the Bowl and two bottles of House of Mandela wine. All opinions are my own. This entry was posted on December 31, 2015 by Sanura of MyLifeRunsOnFood.com in 2015, Interview, Recipe and tagged African, Chicken Thighs, cookbook, From Senegal: Modern Senegalese Recipes from the Source to the Bowl, Pierre Thiam, Red Palm Oil, Senegal, Senegalese, West African.